Cover Art by Kiki Moch Rizky. Pluder & Peril is sanctioned for use in Pathfinder Society Organized Play. Its Chronicle Sheet and additional rules for running this module are a free download (807 kb zip/PDF). This is simultaneously one of the most interesting and most frustrating modules I've used. At a glance, it's a fun, rollicking swashbuckling sea adventure, with a good mixture of intrigue, skill challenges, and good old fashioned dungeon crawls to keep players on their toes. NPCs are well-developed and fun to flesh out. But as one digs deeper into the story--and the workings behind it as a GM--a bevy of inconsistencies, both mechanical and narrative, and poorly prioritized information plague the module and make it frequently difficult to run. I recommend this module for experienced GMs who need a decent seafaring story but are able to adapt on the fly--and time on their hands to do so--and for those who can make use less of the module itself but would benefit from the appendices, e.g., the excellent Shackles map, the map of Lilywhite, the mini-guide to the Shackles in the back, the map of the Magpie Princess, etc. I do not recommend this module for those looking for ease of use or timesaving. I should note I am judging this module as a GM, and I believe modules should first and foremost exist to make life easier for the GM, and evaluate modules primarily on this factor. While of course narrative and fun factor are important--after all, it's no fun to run a boring story--my key criteria for a module is that it saves time and eliminates--not creates--frustration factors of being a GM. People who purchase modules solely for narrative value will not find much use in my review. In short, while there is a lot I admire in the module, that I found it frequently and deeply frustrating to run lowers its score quite a bit. One of the advertised bonuses of this module is that you can use it as a substitution for Skull and Shackles part 2: Raiders of the Fever Sea. I purchased this module for this purpose, unsure my players would find Raiders as fun. Unfortunately, the module's introduction and guidelines provide far too little advice for how to insert the module into the AP, and barely address the key challenge to adaptation: at the end of Skull and Shackles' first part, the party has just gained its own ship, a huge and hard-won prize after a grueling and difficult adventure. The premise of Plunder and Peril, however, requires you join a different captain's ship and submit to a new captain's orders--not something very fair to ask of your players when they've just gained their own captaincy and own ship. There absolutely are ways to work around this--but it is nowhere near as easy to "slip" the module into the AP as the marketing and early product chatter suggested. By sheer chance, some of the choices my players made led this to be easier for me (their encounter with Hyrix and Mother Grund went poorly, and I had them wake up "rescued" by Varossa). Some of the changes I made to adjust to the AP also made more work for me down the line, though some of this was how I was trying to create some open ended options for my players. I accept any changes I made that caused things to be more difficult were MY choices, and the effect of my choices are not part of this evaluation. Regardless, using this module as a substitute for S&S part 2 is not as easy as implied. As a standalone module, it will of course be much easier to use. Each of the three sections are also designed to be used separately if a GM needed a shorter adventure, and I would say that, with some adjustment, the first and last sections especially can be easily adapted to shorter adventures. If the GM is willing to do the (relatively minor) work of removing Varossa from chapter one and presenting the challenges within as simply activities available at the Rum Punch Festival, section one can also provide an excellent "shore leave" adventure for a low to mid-level party. Chapter 3 feels like a dungeon crawl designed for an entirely different adventure with Plunder and Peril shoehorned in, so it of course would be easy enough to extract and use as a standalone adventure--again, just remove Varossa and give the PCs a different hook to explore the island. I found section 1 most fun to run--the town of Lilywhite is well-realized, with the Rum Punch Festival a refreshing backdrop to adventure compared to more gritty or typical spooky dungeon crawls and the like. Its lighthearted tone was especially welcome after the often dark and malevolent feel of the first book of Skull and Shackles--the PCs needed some respite and this provided it (and in a much better way than Rickety's Squibs would have offered). There is a lot of story potential for developing the town further, and the town's features are provided in just enough detail without distracting from the actual narrative. I enjoyed the variety of challenges offered in this section, from some fairly standard combats to some unorthodox skill challenges, including a race that uses a variation of Pathfinder's chase scene rules and a drinking contest, crucial for any pirate campaign worth its salt. The only--but rather outstanding--flaw in the first section is the poor setup for the two "bosses" that challenge the PCs at the end of the story. Firstly, the narrative makes clear that one of the "bosses" is spying on the party, but it isn't clear how he is doing it, or if the PCs should notice (I think the presumption is that the PCs shouldn't, but I'm not sure why). Secondly, and more mechanically problematic, the second "boss" is described in detail about her actions, motivations, and ways of approaching combat---and then her statblock is for a creature that does not have any of the abilities described in the narrative. Per the product discussion thread, this was a development error: this "boss" was originally given a unique stablock, but it was removed for space reasons. Unfortunately, her narrative was not updated to match the new stats she was given. This is a glaring editorial error that absolutely should have been caught prior to publication--especially since verbiage is now wasted describing actions she could not possibly take. Personally, I would have gladly sacrificed any number of things--artwork, other statblocks, descriptions (especially much of the useless dungeon descriptions in chapter 3)--to have kept the creature's original stats, for as described, she had a lot of narrative potential. I opted to create new stats to reflect the story rather than use the stats listed in the module. This worked much better me, but it was work I was forced to do just to make sure mechanics and narrative matched, and should have been unnecessary. The second section is solid series of sea adventures. A combat-heavy chapter, I wish some of the fights had offered the GM more tactical guidance--particularly in Blackwarns Gallows, where the players can approach the treacherous situation in numerous ways, and one has to navigate a potentially incredibly diffficult fight between land, rough waters, and high up terrain with almost no guidance as how to do so. Another encounter, with a ghost on a shipwreck, also needed more details--particularly, there is a potential fight and a hazard, but depending on how you enter, you might be able to avoid the fight/hazard entirely which makes the whole scenario anticlimactic. How to time events and manage the encounter (whether diplomatic or hostile) seemed very vague. I could have used less of another NPC's backstory there and more tactical guidance for what was an unusually set up scenario. At the same time, I liked indeed that there were several encounters and challenges that could be managed by skill, diplomacy and cleverness, counterbalancing some of the combat focus. My players seemed to really enjoy negotiating with the dragon in particular. My only concern about chapter three was the final encounter. As written, the game presumes characters escape a situation by riding some creatures provided them. However, you have to interact with a certain NPC and navigate a fight a very specific way in order to be able to gain the new mounts. There are a number of missteps the PCs could take--or they could simply opt to avoid the NPC or situation--that would as written leave them stranded, with zero suggestions for alternatives. Because I was using the adventure as part of Skull and Shackles, I found a way out using characters and resources from that AP, but standalone, it would have been a challenge to find other solutions. The other problem with the mounts being the only presented solution to the PCs problem is Ride is seldom a skill most PCs prioritize having on a seafaring adventure. As written, this was a glaringly annoying railroad solution in a story that up to this point usually accounted for a few ways to resolve challenges. The third section, the big finale, was sadly most disappointing. After two sections featuring a wide variety of challenges and creative scenarios, the third section moves into an uninspired, bog-standard dungeon crawl. What is worse is, as mentioned above, the dungeon feels very much like it was designed for an entirely different adventure and then shoehorned into the module---complete with hundreds of wasted words on background lore of the dungeon that has ABSOLUTELY NOTHING to do with the adventure itself. The not-too-spoilery gist is the PCs are chasing someone who has run into an old cyclops fortress, which was repurposed at some point by a long-dead pirate queen, who is relavant to the plot. We get almost nothing on what the pirate queen did with the fortress, but paragraphs upon paragraphs about what some cyclops did there millennia ago that provides no information or insight upon the present story. Not to mention half of the information is translation of ancient runes that the PCs have a very small chance of actually being able to translate (and they gain absolutely nothing of value by doing so). If I want to read information on an ancient Golarion empire, I will purchase the appropriate campaign setting guidebook. For a module, I want material that helps me and the players tell the PCs' story in the best and most dramatic way. This section of the module utterly failed in this regard. - Enough guidance on the approach to the area (which may vary considerably depending on how the PCs leave the ending of section 2) and different ways the PCs may deal with an enemy ship they approach, save from who might or might not attack them. - Information on how to run an encounter with a bard NPC who could be friendly but whom the PCs may equally see as an enemy and attack immediately. We are given full stats for the NPC--but in the scenario he is supposed to be badly wounded after a fight, and it's not clear, for example how many spells or rounds of bardic performance he has left. Further, the stats provided show the bard can cast cure light wounds but the scenario describes him at zero hit points and thus helpless--but if he has spells left, wouldn't he heal himself? Yes, as GM I can make this call, but it is very unclear as to what his status would be--and how to respond if the PCs attack him and how difficult an encounter that should be. - Information on the following NPC encounter, where a possibly-formerly friendly NPC is now hostile and insane. The too minimal text on the encounter seems to assume the encounter will turn into a combat to the death, and yet the party could very much want to try to subdue or talk down the NPC (and indeed, my PCs wanted to talk him down). There is NO guidance on if he can be talked down, how, or what to do with the NPC if he is subdued and captured (or how the other NPC interacts with him). We know what the g#$&~*n cyclops runes say, but no clue what to do with two extremely major NPCs whose presence could dramatically alter the PCs experience and challenge level in this dungeon. - For the very crucial boss fight, additional guidance on placement and starting tactics. Especially given the big boss has telepathy and would likely sense the PCs coming, the module needs to provide some approaches both the PCs and monsters might take to the end game. There is SOME advice offered here, but not enough for how important and challenging the fight should be. The boss fight also illustrates a distinct flaw in how Paizo overall chooses to organize its modules in general, which is that they put "lesser" enemy statistics in the adventure text, "important" NPC statistics in one appendix, and other "important" and additional monster statistics in a different appendix. This means in general the GM has to constantly flip through the book or .pdf to get different combat stats, which is very time consuming and frustrating. In this module's final fight, there are three enemies in the final combat. One enemy's statistics are included within the module's narrative text. Another enemy's statistics are in the Bestiary appendix. And to make things extra confusing, there are two sets of statistics for the third enemy, one in the NPC appendix and one in the Bestiary appendix (the latter of which is the correct one to use, but the module directs you to the NPC appendix). So to run the fight straight from the booklet, you need to be constantly flipping between separate sections of the module--the last thing you want to be doing while running an intense boss fight. I had to make my own combat sheet to make the thing runnable, which took time a module should not have to make me take. Personally, I think all enemy statblocks should be put in one place--a single appendix--that GMs can pull out or print separately from the running adventure text, so they can have all the stats they need in one place and can place it side-by-side with any relevant adventure text or maps. This alone would make the entire module line easier to use and, for me, I would purchase more of them were they organized in this fashion. Finally, I must note that the third chapter ends on a bit of a disappointment--the whole point of the adventure is the hunt for a legendary treasure horde, which in the end turns out is not very much of a treasure hoard at all. I understand wanting to make the treasure level-appropriate, but I had to find some creative ways to bolster it (and explain why there wasn't more). (The in-game explanation for where some of it went doesn't make any sense--it says a dragon in the backstory stole most of it, but the whole way the adventure begins is that a background NPC killed said background dragon and found the key to this treasure in its hoard. If the dragon already had most of the hoard to begin with, then the background NPC would have already had it and there would be no point to looking for the treasure!) The larger "treasure" is really the ship and the cyclops fortress that the PCs can move into, but the narrative itself downplays this. I up-played it. Since I WAS indeed running this for Skull and Shackles, gaining an extra ship and fortress for establishing credibility in the Shackles was valuable. If this had ended as a standalone adventure, however, I think the ending as written would have been a considerable let-down for the PCs. In the end I don't regret running this module--and I'm even glad I chose it over Raiders of the Fever Sea. But it did demand a lot more work than I had hoped, and the inconsistencies between chapters and chapter quality speaks to the fact that having three different people write three different sections of a module is a bad idea. Still absolutely the module was worth it for the first two sections, and a great set of NPCs on a ship crew that is usable for many seafaring adventures. I really loved the backdrop of Lilywhite and Captain Varossa and her loyal (and not so loyal) crew, so whoever was responsble for those developments especially deserve kudos. I hope the PCs can return to Lilywhite later and I can play more in it as a sandbox. I like much of Plunder & Peril, but I feel it fails in certain key areas. It’s an interesting experiment to present three short adventures in a Pathfinder Module. However, I think trying to make them both linked and workable as stand-alones was not necessarily the best decision. It has resulted in three adventures that don’t work well on their own (except maybe “Rum Punch”), but as linked adventures, have many ways in which the PCs can go drastically off-script. I also feel it was a poor decision to conclude the three adventures with a dungeon crawl. It loses the style and flair of the other adventures and doesn’t have the opportunity to regain them that it might have if the dungeon crawl happened in the middle. 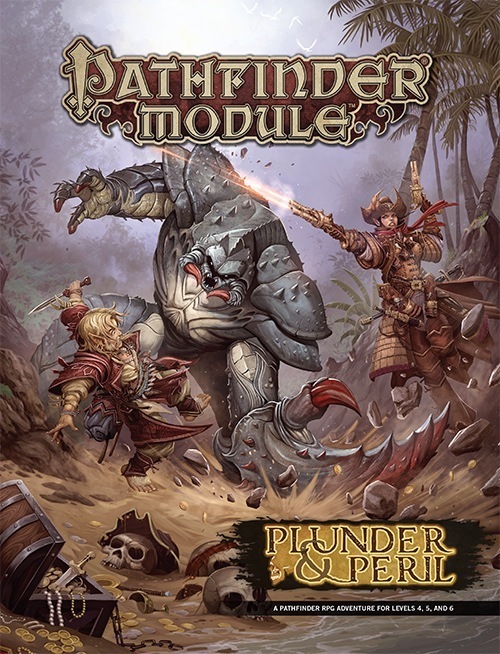 In the end, Plunder & Peril ends up as a mostly mediocre module. first off, I dinot play this module yet. I have just read this module. All I can say its a must-have module for someone who realy like corsair storys / enviroment. Its everything you want from a pirate adventure and more! From a GM perspective, its has a good build up, the information is where you expect it to be, and if you want, you can easily expand on this. After finishing this module last night, I have to say I will miss it. It has been an enjoyable time with my group and I wanted to say well done to the creator. There is variety here, and although the end may seem a little dungeon crawlish, it pays off in the end with a very interesting encounter. Each chapter has a different feel, with chapter 2 being the longest of the three. If I had to knock off a point for anything it was the lack of a ship to ship battle. I felt any pirate adventure on the high seas should include at least one ship battle. However, the way the game is designed you can easily create your own encounter and insert it as a "random" encounter, since you can roll for those anyway. If ship combat doesn't appeal to you, you can skip it and the module runs fine as is. The only other criticism I got from the players was how the game really doesn't reward the players until the end, which is a huge haul to be sure. However, they felt some better rewards should have been sprinkled along the way more often. This could also be fixed by not following a strict path and allowing the players to sandbox more. It will just take more work from the GM. Overall, if you are looking for some high seas adventure and want to see exotic locals and meet interesting NPC's while roleplaying or rollplaying your way to a hoard of treasure, look no further than Plunder and Peril. Arrh! Can't ever get enough o' pirate-y goodness! What levels can this be for? There are so many details I need for this! Are these quests linked, or are they fully separate stories? I really liked the larger modules you started, this seems a step backwards. Will hold my reservations until I see it though. The blurb is really unclear on what exactly this product is going to be. Will I be able to buy it and enjoy it like a normal module? is it a series of loosely connected quests, or a single strong story? What exactly does it even mean "building upon the AP/card game"? I really hope that the module line will remain a place for min campaigns, and not some weird hybrid product that supports other products. It's got 4 authors, and given the blurb, I'm guessing it's probably sort of a "three adventures loosely linked but that can also be run independently" sort of thing. If it was part of the card game sometimes they would give you the option to opt out of it for that product if that is what you chose.. But why would you opt out IF it is still a module? Even if it is a hybrid, it would still work as an adventure but also give the options as another something for the card game TOO. Because I have no interest in the card game, I'm as yet unconvinced that including card game support in a Module is a worthwhile idea. How does adding card game support make a Module better? Very cool. I am running Skull & Shackles and can always use more stuff in the sandbox. I hope there is just ONE module author and the rest just help write magic items and the like. Paizo picked the 64 page format and the quarterly release schedule, so they should pick an author that can handle 64 pages of coherent story. I guess we'll find out more about this product as the release day gets closer. I have been impressed with The Dragon's Demand. So much so that I added the modules subscription to get Tears at Bitter Manor. I've briefly skimmed Wardens of the Reborn Forge. I have to say that these first three entries have been pretty much what I would hope for out of the new module format. Now we have the summer release being a mega-dungeon. It's kind of steps outside that mold a little. Not my cup of tea, but we can't please everyone with every release. But I was hoping for a single coherent adventure in the level 8-12 range (in between Bitter Manor and Reborn Forge). I'll anxiously await further details! This will tie into the card game in the same way that the Pathfinder RPG version of Burnt Offerings ties into the first adventure deck of the Rise of the Runelords Base Set. For those who don't play the card game, this module will be completely playable as a standalone pirate adventure, or can be integrated in whole or in part into an ongoing Skull & Shackles game. Those playing the card game are likely to see locations, characters, and plots from this adventure appear in some form in the Skull & Shackles AP during its 6-month run. So, which levels is this for? Or are there three different adventures which have different levels spread. Finally, does this repeat some of the adventures from S&S but in a smaller and more compact format, or are these different adventures but in the context of S&S? 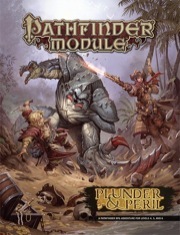 Mark, I think that Paizo may have wanted to create a blog post, or even a short blurb on YouTube, about the specifics of how this module will connect with the other product lines. I'm continually impressed with the quality of Paizo's products, which allows me to shrug off ambiguity in Paizo's favor. Not everyone shares my prospective, however. That, and I'm really excited to see what these authors have in store for us! While admit I'm confused about how this will work with the card game, Paizo has never given me reason to doubt them, so I'll wait and see. My issue comes more from the fact that I just wish "Skull & Shackles" would just go away. But even then, that's because I had bad experiences with that AP as both a player and a GM. I'm pretty sure "tie in" means that there will be cards and quests in the upcoming chapters of the Skull & Shakles card game that will share names and themes with the three adventures in this adventure module. Nothing more. There won't be cards in this adventure for use in the card game, or anything like that. What TwoWolves said. If we were doing a PACG set that took place entirely in a remote Isgeri orphanage (which I can't imagine us doing), we'd likely release other products about orphanages, Isger, and other related topics. This is the same thing, just about pirates. It allows us to explore some of the new content presented in the PACG in a Pathfinder RPG adventure format. Other than involving some of the same themes, locations, NPCs, and so forth, this adventure and the Skull & Shackles Base Set won't interact. I am still confused, is this one 64 page adventure with 3 different authors writing different chapters for it? 3 separate unrelated quests written by 3 different authors? Or something entirely different? Without giving anything else away, I will say there are three separate adventures with a running plot or theme, that can be played together as an ongoing story, or played as stand alone adventures with little to no modification. And there are a lot of fun things going on with this adventure. It's awesome working with the other guys on this. You'll definitely get a cohesive plot developed concurrently by the different authors. And with that I'm back to writing an encounter that will freak you out. And which levels are the three adventures for? I'm immediately interested, but I'd like to know what levels it will be/is designed for, as others. Any chance that this will be out in time for talk like a pirate day (Sept 19, 2014)? They assume medium progression. each can be taken on its own, or lead into the next adventure. Interestingly that means you could also use Plunder & Peril in place of Raiders of the Fever Sea. Thematically it ties in nicely, the levels work out, and it can end in a place that can lead in to Tempest Rising. A pirate is never late. Nor is he ever early. Do these adventures assume the PCs have their own ship? In the case of using Plunder and Peril as a Skull & Shackles plug-in, does the PCs having their own ship defeat some of the adventures? The adventures assume the PCs don't have a ship at the start of the adventure. Having a ship would require some adjustments on the part of the GM. Awesome! After the disappointing flop of Razor Coast, I'm itching for a good pirate module. Shouldn't the cover be updated now? I think you might have an exclusive on that opinion. Strange indeed, product entry not updated two weeks before the supposed shipping date to the subscribers. Indeed, not a lot of information on this one yet. I just noticed that Matt Goodall is writing this thing (or at least one of the three adventures). He definitely proved his worth with the Islands of Plunder plug-ins. Those are great to use with Skull and Shackles. I'm curious to see how he tackles this one. The only thing I find strange is this: Paizo went from 32 pages to 64 pages in its adventures, only to divide those into smaller parts again in this module. I certainly hope that the running plot is compelling enough to pull the scenarios together. You can easily run the three adventures (Rum Punch, Dangerous Waters, and Black Coral Cove) as a single adventure with strong chapters, rather than three unrelated adventures. So are these three adventures the same as the introductory scenarios in the Pathfinder Adventure Card Game Skull & Shackles Base Set? Yeah I am thinking the same thing here...should it not be updated by now? No... see some of the reviews floating around. They're actually pretty accurate (it just depends on how much certain things bother you). For Plunder & Peril - I too was a bit surprised at the '3 adventures'... but that might not be a bad thing. I'd like to see how it turns out. I agree with everything you said, except for the "No" part. The OP did say "flop" and Razor Coast is the opposite of that. Endzeitgeist's review is right on the money (as usual). RC is brilliant, albeit it does have its flaws. Flaws that could be seen as deal-breakers for some (which would constitute a "flop" for those people). And whether you agree with the "no" or not - it is highly unlikely that said individual has an "exclusive on that opinion". In fact, that's factually false (even as hyperbole). And... that's enough of Razor Coast when this is about Plunder & Peril! I do find it interesting that the level range for this particular 64-page module is (seemingly) less than the previous modules of this size (it is ~3-4 levels like a few of the others, but in a lower level range - and nowhere close to Dragon's Demand range, which I didn't like at all). I consider that a very good thing. If people want to see the cover you can find it in the new product catalogue.